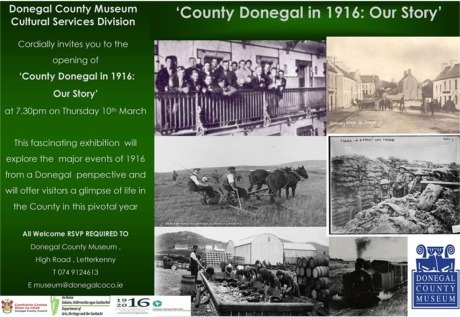 DONEGAL County Museum’s new exhibition ‘County Donegal in 1916: Our Story’ will be officially opened later this week. The fascinating exhibition will explore the major events of 1916 from a Donegal perspective and will offer visitors a glimpse of everyday life in the county in this pivotal year. “Our new exhibition will give people an opportunity to learn more about the events of 1916 and their connection to the county. These events, both at a national and local level, shaped who we are as a nation” says curator Judith McCarthy. The exhibition will include many artefacts including witness statements, letters written by Patrick Pearse and Roger Casement as well as the infamous Niall MacGiollaBhríde name plate. “This exhibition is about telling the story of Donegal during this period and we believe that more connections and more stories will be uncovered as the year unfolds” added Ms McCarthy. A children’s activity booklet is also being developed and this will allow children to experience the exhibition in a more interactive and fun way. Meanwhile, on Sunday, April 24, 2016 from 1pm to 5pm, there will be a special viewing of the exhibition to commemorate the date of the 1916 Easter Rising. Guided tours will be available for groups of 10 and over. Admission is free but pre-booking of the tours is required.